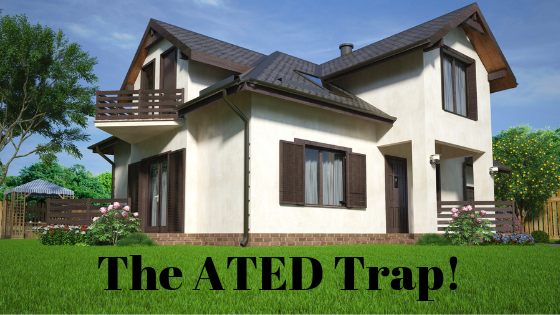 One of the most recent property tax changes has been the introduction of the Annual Tax On Enveloped Dwellings (ATED). The tax is payable by all companies (whether UK based or not) on all residential properties valued over £500,000. There are many important questions that taxpayers should be asking themselves. When does an ATED Return have to be filed? An ATED Return must be filed by 30thApril of the year to which the charge relates. For the year commencing 1stApril 2018 that means 30thApril 2018. Any liability must also be paid by 30thApril 2018. However, this causes another problem. To pay the liability, the taxpayer must quote an ATED reference number and to get a reference number the taxpayer must file the ATED Return first and then wait at least 10 days for HMRC to supply the number. How do you know whether the property in question is subject to ATED or not? Owned by a limited company or a partnership where one partner is a limited company or by a collective investment scheme. How do I know if I require a valuation? Taxpayers may have obtained a valuation of their property on 1stApril 2012. Further valuations are required every FIVE years with the second valuation date being 1stApril 2017. The property qualifies for reliefs and exemptions and is expected to do so through the entire ownership period. If the value of the property is near the £500,000 limit then we would recommend that you get a valuation from an independent valuer. You can ask HMRC for a Pre-Return Banding Check if your valuation is within 10% of the banding threshold. Unfortunately, there is one problem. HMRC will not give you the Check if you are going to claim a relief which reduces the ATED liability to Nil. HMRC will take their time responding to a pre-return banding check so get your applications in early. What properties are subject to relief and exemption? There are a number of reliefs and exemptions in place but they need to be claimed on a relief declaration form. used by a body established for national purposes. What are the potential tax charges for 2018/19? Because of the restrictive time limits for preparing and filing the Return and paying over any liability, if you believe that you will be subject to the ATED Rules then you must act NOW!